At 2.5 million square feet, the Macy's in Manhattan's Herald Square is the largest store in the U.S. But an entire city block of real estate in one of the world's busiest spots is little more than a burden if the legacy retailer can't figure out how to attract customers in the age of e-commerce. 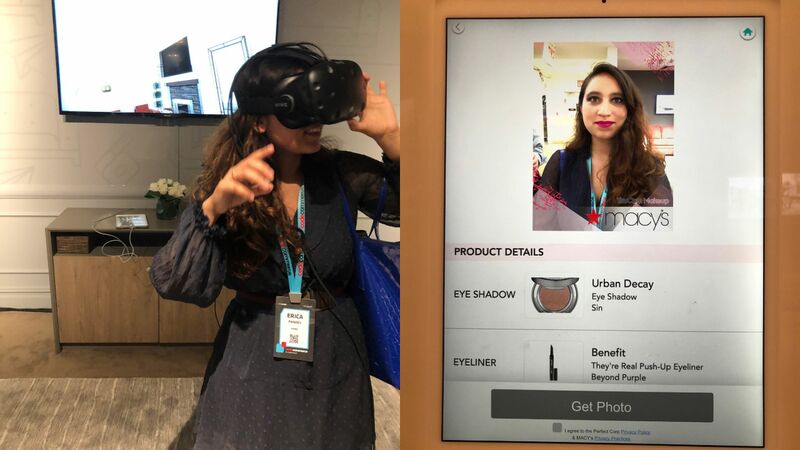 Visiting New York, I tested some of Macy's new virtual reality, augmented reality and machine vision features. The big picture: Although this stuff is at the cutting edge of what’s available in the U.S., it's old news in China. They are going to have to do better. In the furniture department of Macy's, you can slip on Oculus headsets to picture a sofa or a dining table in your home. You can swap pieces in and out, and walk around to see how everything fits. You can virtually try on hundreds of eyeliners, mascaras and lipsticks without getting your hands dirty. A new feature called "Market" takes on Amazon — a section of the store reserved for smaller brands that have flourished online but want to get into brick-and-mortar stores. But, but, but: All of these features and more have been commonplace in China for years. JD.com has mastered unmanned store technology in China and is beginning to take the concept abroad. Alibaba has long incorporated augmented and virtual reality into its brick-and-mortar outposts, including at the Starbucks Reserve Roastery in Shanghai. One Macy's employee told me: "They're ages ahead of us."